Steve Jobs once likened the Mac to a truck and iOS to a car. Even with how little he knew of the future of iOS back in 2013, I still think it was a bad analogy.2 If anything iOS is a motorcycle. It's fun, light, and makes you think really hard about what you might need on a road trip. The simple fact that iOS still has a screen that directs you to plug into a Mac to recover the device, tells me what Apple thinks of iPad independence. The very first thing I had to do with my shiny new iPad Pro was plug it into a 2013 MacBook Pro. I was unable to login into iCloud on the new iPad. It just said "Verification Failed." I could login through Safari, but no iCloud settings could connect. After a call to Apple, they suggested a reset of the device THROUGH MY MAC, which did the trick.4 Apparently I got a bum install of iOS at the factory. I could have visited an Apple Store to do this. Making an appointment is now much easier with the iOS Apple Store app. Prior to that, I would have needed to browse through the Apple website in Safari and entered all of my details in a web form. If you spend much time on iOS, you may already be cringing. Web forms are kryptonite for iPads. The web is still not iOS friendly. It's improving but there's a lot of legacy out. Not enough business is dependent on serving people that don't have a PC or Mac. There was a time when storage was the main reason I needed a Mac. That's still a good argument but only if you really commit to making a lot of excuses for your hoarding. My photo collection on my Synology NAS is about 3 TB. The maximum storage I can get through iCloud is 2 TB. That's annoying but I only have myself to blame. Well, that and all of these high resolution iPhone photos of the inside of my pocket. When I bought the new iPad Pro, I made sure to get the maximum storage available, which is 500 GB. 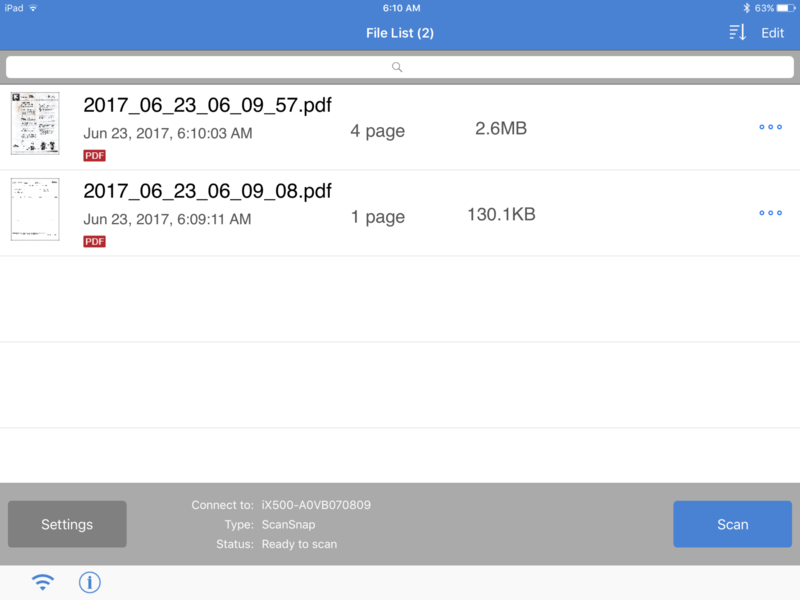 With file management coming to iOS 11, it looks like I'll be using my iPad even more. 500 GB is not that much space but it will give me room to breath. I look forward to a future when my computer just knows what files I'll need on a plane or when I'm at a conference and the entire city is using the same WiFi network. Until that time, I'll keep most of what I might need stored locally on the device. But that brings me to a new problem on iOS. Finding what I'm looking for is getting harder. Spotlight is poorly tuned for showing me what I need. In fact, it often thinks I want to download a new mortgage app when I search for my recent mortgage statement. Maybe iOS 11+ will solve this problem. Right now I have 20 years of files, of which, 7 years are pretty vital. I keep almost every important document encrypted in DEVONthink and sync between devices with Dropbox. By keeping my documents siloed in one app, tagged, and sorted into folders I can usually find what I need pretty quickly. But iOS makes it difficult to work with the files outside of DEVONthink and save changes back. My Mac does this reliably. I think it's ironic that the most portable computer I have is the least comfortable to type with while on the couch. 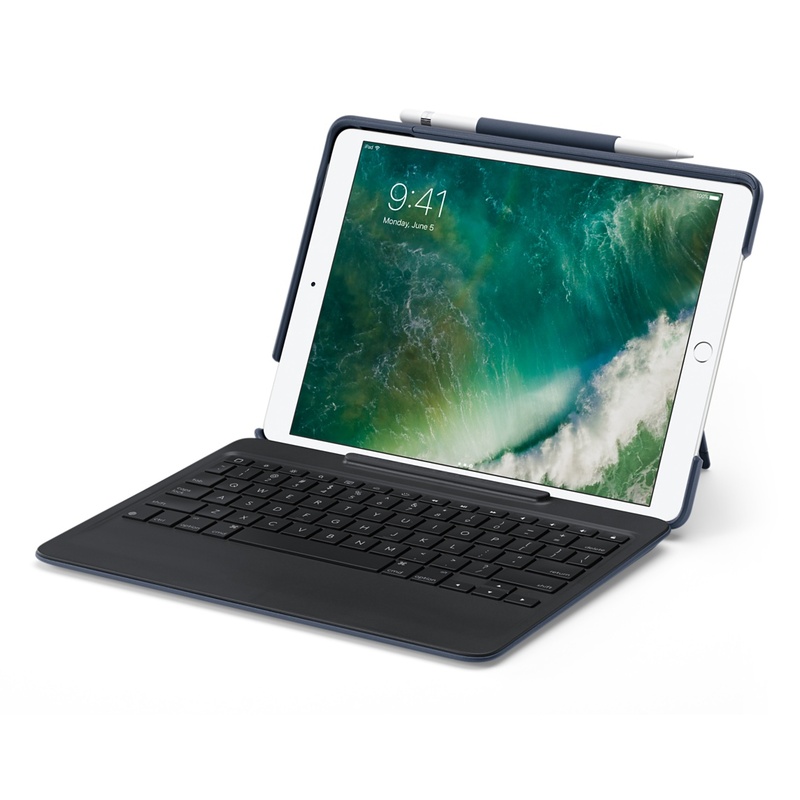 I have the Apple Smart Keyboard as well as the Logitech Slim Combo keyboard for the iPad Pro 10.5" and I have no complaints about the key spacing. It really is close enough for me to type at normal speeds. But both of these keyboards work best on a hard flat surface. I do my best Chris Farley impression when I'm trying to type with my iPad on my lap. I can type more comfortably on my iPhone than I can with my iPad Pro on the couch, in bed, or even just reclined in the backyard. I'm sure there's a good case out there that will solve this problem, but I'd rather see Apple solve it. The Slim Combo is a nice case but not a very good keyboard. I like the back-lighting of the keys and the key spacing keeps me typing at full throttle. I also like the amount of key travel. Even the Pencil holder is a nice touch. But I really have to say that the kickstand stinks. It's functional but a pain to use. The keyboard easily disconnects when I don't want it to. Finally, the case is pretty thick. It takes the svelte and elegant iPad and turns it into a swollen awkward piece of plastic. Looking back that the Venn diagram above, there's a little sliver of functionality for the iPad that my Mac just can't touch.6 The Pencil on the iPad Pro is a terrific device. The responsiveness makes it feel like writing on a whiteboard. The flexibility in iOS means it's not just for drawing or writing. Apps like Linea and Paper are a lot of fun with the Pencil. I like to doodle and draw cartoons. The responsiveness of the Pencil and new iPad Pro makes me want to use them instead of paper and pen, which I never thought was possible. I tried to take meeting notes on the 12.9" iPad Pro with the app Nebo. Nebo does live conversion of handwritten notes to typed text but it also provides a way to combine drawn diagrams in-line. The 12.9" iPad Pro was a distraction during meetings. It was just so large that I think it became a focus of attention. The 10.5" iPad seems much acceptable. Because I'm actively writing with iPad flat on the desk with a Pencil, there's no chance people will think I'm browsing email either. I've only used it in a few meetings so far, but the acceptance is high. It also makes it a lot easier to send out meeting notes when compared to transcribing notes on paper. Dreaming about the future, I think Apple can bring the iPad close to parity with the Mac.7 I don't have as many complaints as some. I don't need USB connections. I can scan from my Fujitsu ScanSnap over WiFi just fine. I also think a better keyboard is inevitable, but voice and handwriting recognition is getting dramatically better. 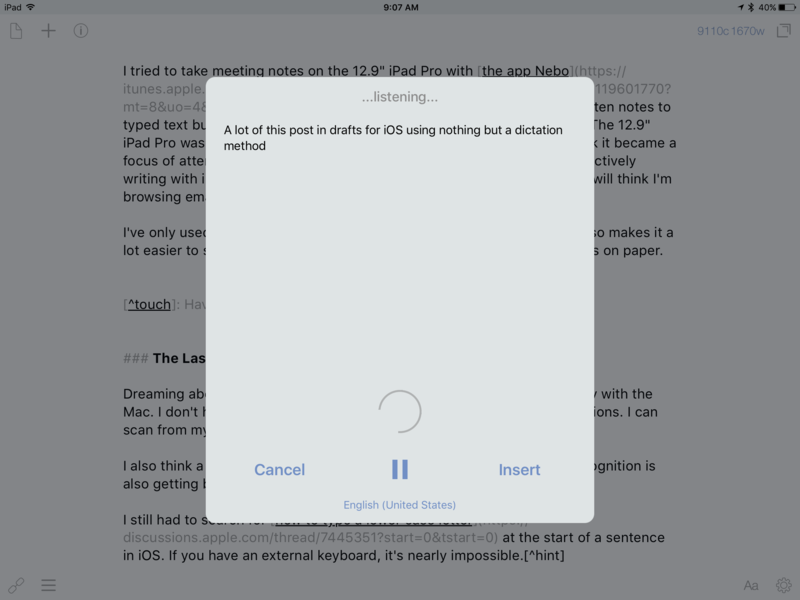 I wrote a lot of this post in Drafts for iOS using nothing but the dictation input. It's fine for a first draft while I'm sitting alone at home. 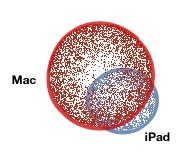 But Apple has a blind spot that I think might mean the iPad never has parity with the Mac. The App Store just doesn't encourage big powerful app development. The price point on the iOS App Store is too low for many indie developers to succeed. I look at the most powerful apps I use and they come from a handful of companies dedicated to craft but supported by Mac revenue. Omnigraffle, OmniFocus, and OmniOutliner are great. But there are few competitors in this space that can reach the same level of quality and still make a profit. I suspect that in an iOS-only world these apps would end. Transmit and Coda by Panic are top-tier software, but even they seem to be struggling to justify their existence. This doesn't mean that great apps don't still get released on iOS. They just don't keep getting supported. My favorite text editors, the best personal databases, the variety of bookmark managers. They might keep rolling out, but the majority aren't actively developed. From the outside, it looks like the Mac is a platform to build a business on and iOS is the place to sell your passion products. I'm not sure what Apple can do to change this. The roadblocks were built when Apple first set their app price points at the bottom. Most users think a dollar is too much for anything on iOS, but anything short of $20 is probably not sustainable for a small developer. I feel like Apple will take us almost to our destination by making insanely great iPad hardware with the best operating system money can buy. Unfortunately I fear that we will be lacking the vibrant and diverse software to get us that last mile where we don't just wish we had a Mac.